If you have a rotating dance pole, safety is extra important. That's because while spinning poles can definitely be a LOT of fun, they also have some inherent risks. Using this type of pole requires greater body awareness and more strength due to the centrifugal force created during faster spins. And of course you'll need time to adjust so you don't get dizzy spinning round, and round, and round, and....well you get the idea! Here's a video clip demonstrating just how amazing your moves can look when your pole is spinning as well as your body. Hopefully you can also see why Your Pole Pal feels it's important to cover the topic of rotating dance pole safety, as the dancer is spinning at a pretty good speed during some of her moves. Enjoy the video, then be sure to read the rest of this page so you can learn how to stay safe while rotating too! Now that you're all inspired and raring to go, here are a few things to keep in mind to ensure you use your rotating dance pole safely. The general rule about not using anything on your hands (creams, oils or lotions) applies doubly when using a rotating pole. Remember that lotions reduce your ability to grip and hold. When you add the rotation factor, your chances of becoming unintentionally detached from your equipment during an airborne move go way up. And that's no way to stay safe! 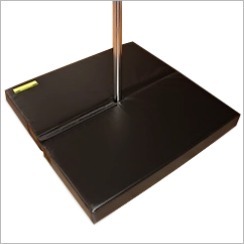 In fact, you may want to consider using one of the many pole grip products that are widely available. Once again, Your Pole Pal reminds you that it's important to learn and practice new moves using the stationary setting before you graduate to the spinning option. All rotators come with a locking pin that gives you the option to use it in spinning or stationary mode. It's challenging enough to learn how to pole dance - especially when you're going after some of those really fancy tricks - never mind having to cope with the spin factor at the same time. Besides, nausea is a very real concern...especially if you're inverted, spinning, and rotating all at the same time! Of course it goes without saying that you should familiarize yourself with your specific rotating dance pole's safety features before you use it. You'll want to ensure you understand how the mechanism works so that you'll know whether it's in spin or stationary mode when learning new moves. And finally, ALWAYS check the cotter pin or locking device before every use. Make sure you know whether the setting is on spinning or stationary mode before you start to dance, as unexpected surprises can be very dangerous. With just a little common sense your rotating dance pole can provide you with loads of extra fun without compromising your safety. As with most things in life, the more respect you show it, the more it will give you in return. XPole offers a portable (multi-piece), friction fit, rotating pole. The Lil Mynx rotator comes in stainless and coloured one-piece models, and offers the extra safety and security of a bolted ceiling mount. Make extra sure your hands are clean and dry...rotation + spins + hand lotion = danger! Thinking of buying a rotating dance pole? Be sure to check out these reviews for detailed information on all the different brands available.